I want to thank everyone who left me an uplifting comment yesterday. I could feel the love and prayers as I went through my tests. I know I haven't given many details about my health scare because I really don't have any answers yet. Last evening's test were the MRI an MRA (which I had never heard of before). Since I am extremely claustrophobic I stressed out a lot. Actually it wasn't a bad experience. Since it was of my head and eye, my whole body wasn't in the machine (which was a lot shorter and not as tight as I thought it would be). Now I have a week to wait to see the specialist to hear if the news is good or bad. 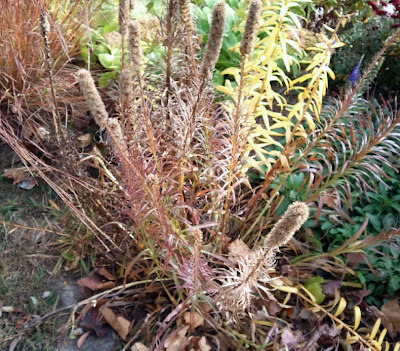 The photo is of a little dried fall garden by the sidewalk that I saw about a week ago. I took the photo with my phone. I have loaded 5 more quilt tops for sale on my Wandaful blogshop. Elsie purchased one of my quilt tops a few years ago and she just finished a fantastic job of quilting on it. Check it out here. The waiting is the worst! Even with the full MRI you would have been fine, I'm sure. I was really nervous to have one, even took my husband which I never do. They do everything to make it comfortable and it was. I am so glad to hear that the tests weren't as bad as you expected. I had never heard of an MRA either. So now I have learned something new today. You have been on my mind so often, Wanda. The prayers are still coming your way. Glad the MRI/MRA wasn't so bad. Waiting is the pits. So glad you made it thru the tests without too much stress. Lets hope the results are good news! Was thinking of you and really hope that all turns out well. Sending my thoughts and prayers your way! I am glad you made it through. I hate waiting on tests. Sending prayers your way. I have been through testing several times over the years - the worse 24 years ago to find out if I had MS or a rare muscle disease in the Lupus related diseases - the waiting was awful but just finding out what I was facing was a relief because then I could face it and find out what to do. Keep busy and know that we are all hoping for the best. Good for you for getting through that Wanda. I had an MRI for the first time last year and the thought of it does rattle you a bit but you realize that you can do it. I think the waiting is harder, but hopefully you won't have much of that. Now that you have coped with your last test, my prayers will remain with you. And pray the outcome is in your favor. I just smiled when I saw your photo, you are always thinking of your followers to show something new everyday. I love how nature puts on a show every season also. Bless your heart - the waiting is so hard. Praying for you that you can get good sleep at night and that news, when it comes, is good. i know everyone (myself included) is praying for you to have a good report! 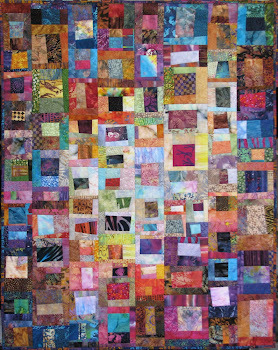 And, Elsie rocks....what a beautiful quilt top that was transformed into a spectacular quilt. May these last few days of waiting speed by and you find out what "it" is . . . sending super-sized hugs, prayers and ever so many good wishes!!! I will send good thoughts your way, Wanda. Hopefully it will be good news. The waiting is always the hardest part. I'm so happy to hear the MRI wasn't as awful as you had imagined, and look forward to hearing more good news soon. 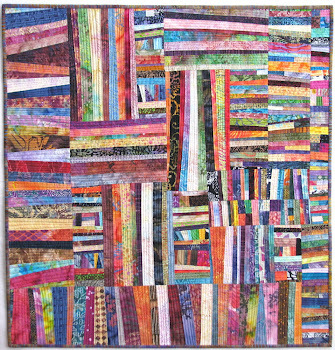 You're an incredibly strong, creative, woman, and have loads of quilts to make before you get slowed down by health problems. Sending all good thoughts your way. So glad that the experience of the tests was not so bad. I'll be thinking of you in this hard week while you wait for the results. Waiting for results is SO hard! I'm glad you didn't find the tests as hard to get through as you feared. The MRI machine is rather daunting and so noisy! It is always nice when you get the tests over - I am glad that you won't have to wait long for the news. Sending your warm thoughts and best wishes for results day. The waiting is always the hardest but I am sure that you will spend as much time as you can creating. I love your pretty Christmas pillowcases in the last post. I agree the waiting is the worst part. My thoughts are with you.I had my own medical experience ten years ago so I know how stressful it is. I am sending lots of prayers your way. good luck. Hope all goes well with your test. The waiting is the most difficult part for me, too. Glad to hear the MRI wasn't so bad. Hope you hear good news soon. My daughter had an MRA when she was 4. I'm glad you didn't have a difficult time with it-(she didn't either. Hope all turns out well. I enjoy looking at your projects and look forward to many more! Prayers being sent your way. I was out of town all week and behind on following my favorite blogs. I am wishing you the best results from your tests and my prayers are with you. OMG, I've been away from blog reading. Am sending Positive Thoughts and Energies for you and these test results.